What do you all have planned for the weekend?? We don't have too much going on (which is really nice). Todd has a very busy work schedule for the next few weeks so he will be working all day Saturday. I have brunch plans with friends and otherwise I'll be doing baby things around the house! Sunday is pretty low key, too...church and getting things done in the nursery! I can't believe baby DeWire's due date is in 6 weeks. SO much to do! I have another maternity look for you all today. 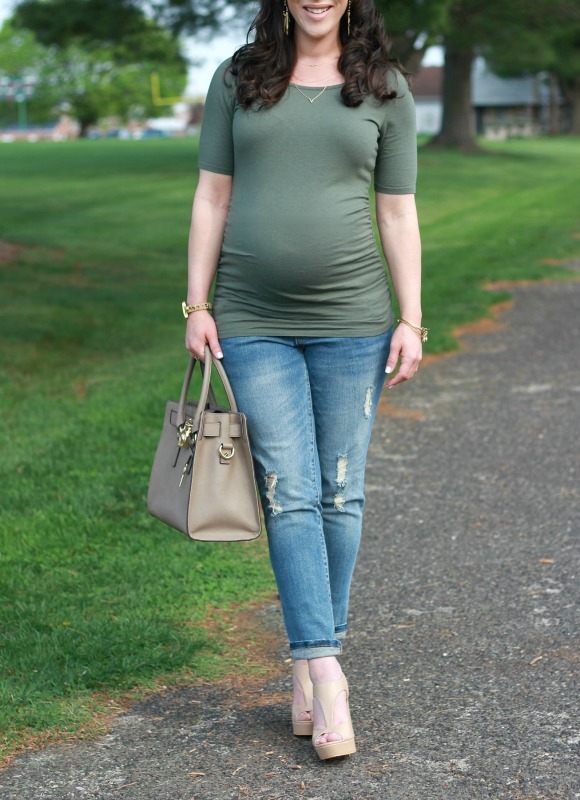 My top and jeans are both from Motherhood Maternity, but this outfit can be easily recreated with non maternity clothing! I found both this side ruched elbow sleeve tee (I'm only seeing black and white online) and distressed over the belly jeans (similar here) in stores on the sale racks. Both are so comfy and stylish! I love how there is trendy distressed denim out there in maternity wear. Other good places to shop for maternity denim is ASOS (FYI, their jeans run small) and Target. I also hear great things about H&M. I kept my accessories and shoes neutral for this outfit. 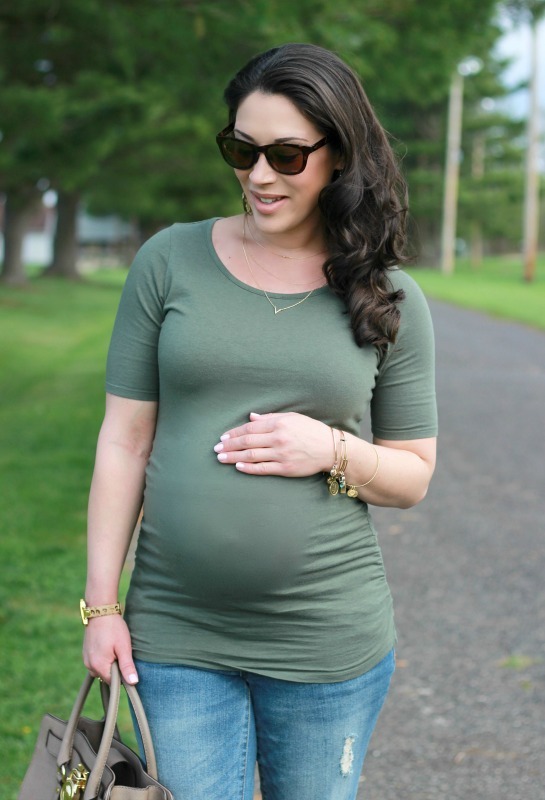 I think olive green is so pretty with neutral colors and gold jewelry! I wanted to share this adorable layering necklace with you all...it's available at Nordstrom Rack and only $9.99! 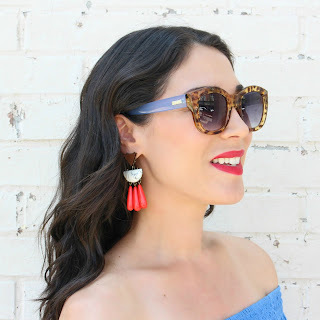 I love statement jewelry but I prefer simple jewelry for every day wear. This 3-row layered necklace is so cute and goes with everything! All other details are linked above and in the widget below. This look is stylish and comfortable-looking too! I love the shoes especially. Thanks for linking up with Jennie and I for Fabulous Friday!